Heated/Cooled Leather Seats, Nav System, Aluminum Wheels, ENGINE, 6.2L SUPERCHARGED V8 DI, VVT, SEATS, LEATHER-TRIMMED WITH SUEDED IN... AUDIO SYSTEM, CHEVROLET MYLINK RADIO.. ZL1 trim, RED HOT exterior and JET BLACK/RED ACCENTS interior ======KEY FEATURES INCLUDE: Heated Driver Seat, Cooled Driver Seat Rear Spoiler, Onboard Communications System, Aluminum Wheels, Keyless Entry, Remote Trunk Release, Heated Mirrors, Alarm. ======OPTION PACKAGES: TRANSMISSION, 10-SPEED AUTOMATIC includes transmission oil cooler and (BTV) remote vehicle starter system, AUDIO SYSTEM, CHEVROLET MYLINK RADIO WITH NAVIGATION AND 8 DIAGONAL COLOR TOUCH-SCREEN, AM/FM STEREO WITH SEEK-AND-SCAN AND DIGITAL CLOCK includes Bluetooth streaming audio for music and select phones; voice-activated technology for radio and phone; featuring Android Auto and Apple CarPlay capability for compatible phone and Shop with the ability to browse, select and install apps to your vehicle. Apps include Pandora, iHeartRadio, The Weather Channel and more, SEATS, LEATHER-TRIMMED WITH SUEDED INSERTS FRONT BUCKET, RECARO PERFORMANCE (STD), ENGINE, 6.2L SUPERCHARGED V8 DI, VVT (650 hp [485 kW] @ 6400 rpm, 650 lb-ft torque [881N-m] @ 3600 rpm) (STD). Chevrolet ZL1 with RED HOT exterior and JET BLACK/RED ACCENTS interior features a 8 Cylinder Engine with 650 HP at 6400 RPM*. 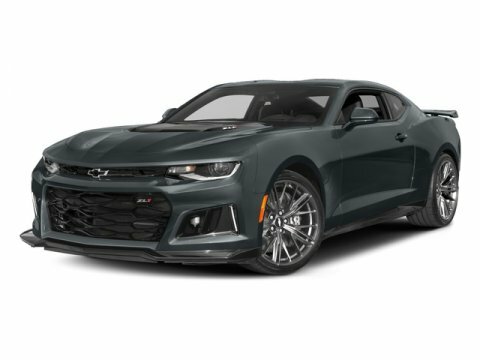 ======VEHICLE REVIEWS: Edmunds.com's review says We also like the 2018 Camaro's precise handling, smooth ride on the highway and plenty of standard equipment for the money. If you haven't been around a Camaro in a long time, you'll likely be shocked how refined the latest version is.. Approx. Original Base Sticker Price: $74,300*. ======OUR OFFERINGS: Florida's premier Chevy Dealer in New Smyrna Beach! If you are looking for a trusted Daytona Beach Chevrolet dealer, Deland Chevy dealer Pricing analysis performed on 3/6/2019. Horsepower calculations based on trim engine configuration. Please confirm the accuracy of the included equipment by calling us prior to purchase.